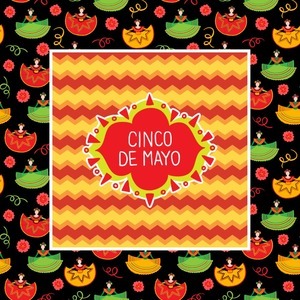 Cinco de Mayo is a time for celebration, color, and fiestas! Emerse yourself in culture as you use this fun design to bring joy to yourself and those around you. This is the perfect design to help celebrate Cinco de Mayo. The design has two layers, one inside the other. The inner layer is a fun orange and red chevron. The outer layer has illustrated ladies wearing traditional Mexican skirts with flowers and confetti all around them. The background of this pattern is black, which really makes the bright colors of this pattern stand out. In the very middle of the design is a fun frame with the words "Cinco de Mayo" written inside. This design is easily customized in our design center. Change the graphic to a frame you can fill with your own text. Change the colors of the chevron or the background. Have fun browsing through our thousands of patterns to find exactly what you want. Have a fiesta with this design!